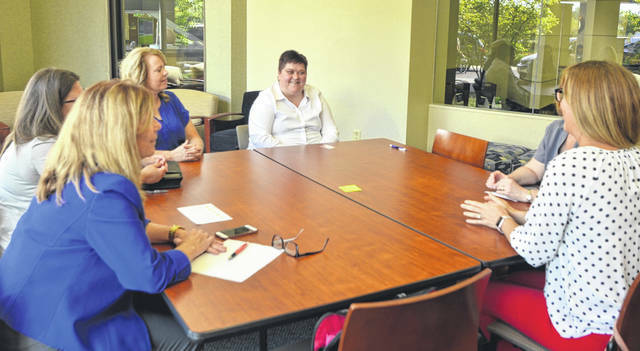 Members of the Patient Treatment Intervention Team — Renee Goodwin, Susan Hawk, Danielle Schimmoeller, Patty Blevins, and Katie Thompson — meet with patient Serena Coulter, face not shown, to discuss her progress with coping with her mental illnesses at Mercy Health-St. Rita’s Medical Center. LIMA — For the past seven years the Patient Treatment Intervention Team at Mercy Health-St.Rita’s Medical Center has helped patients like Serena Coulter reduce emergency room visits and get connected to beneficial recovery resources, according to Susan Hawk, Treatment Intervention Team facilitator. Coulter, 35, has struggled with several conditions such as Attention-deficit/hyperactivity disorder, anxiety and depression since a child. Prior to joining the program, it was very difficult for her to cope with her conditions, which caused her to visit the Emergency Department and urgent care about 70 times a year. It was not until 2015 that she decided to finally seek help through the Patient Treatment Intervention Team, a free voluntary program created in 2011 to address patients that have multiple or excessive emergency department or urgent care admissions in order to get them connected to resources that better help support them and help change their behavior. “At the end of the day, it’s really about understanding from the patient’s perspective what is important to them, what matters in their life, how do they become healthier and learn how to cope with, trauma, bad things that have happened to them and behaviors that they have acquired,” said Hawk. Since joining the program, Coulter has been connected with the Board of Developmental Disabilities, Benchmark Day Services, Delphos Family Practice and Coleman Professional Services, which, Coulter said, has helped her out tremendously. Allen County Board of Developmental Disabilities Service Support Associate Katie Thompson helps coordinate Coulter’s residential, transportation and financial needs as well as home health and day services. Benchmark Day Service Programmer Renee Goodwin helps coordinate transportation to Coulter’s day program and any other needed support. Nurse Care Coordinator Danielle Schimmoeller helps Coulter with medical problems and concerns either over the phone or by help coordinate prompt appointments with Dr. Danielle Westrick at Delphos Family Practice. Patty Blevins at Coleman Professional Services helps Coulter with after-hour needs and services from the crisis center. Since 2011, the team has helped about 24 patients through recovery and have helped them successfully reduce their ED visits by about 40 percent, said Hawk. https://www.limaohio.com/wp-content/uploads/sites/54/2018/09/web1_treatment-2.jpgMembers of the Patient Treatment Intervention Team — Renee Goodwin, Susan Hawk, Danielle Schimmoeller, Patty Blevins, and Katie Thompson — meet with patient Serena Coulter, face not shown, to discuss her progress with coping with her mental illnesses at Mercy Health-St. Rita’s Medical Center.